It is the dawn of the sixth millennium and the skies are darkening, for the suns themselves are fading. Humans reached the stars long ago, building a Republic of high technology and universal emancipation - and then squandered it, fought over it, and finally lost it. Fading Suns is a saga of humanity’s fate among the stars - a space fantasy game of deadly combat, vicious politics, weird occultism, alien secrets and artefacts, and unknown and unmapped worlds. 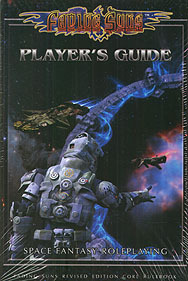 The Fading Suns Player's Guide contains rules for character creation, skills, traits, psychism, theurgy, technology, cybernetics, starships, and much, much more!